A story that had potential but fell short. 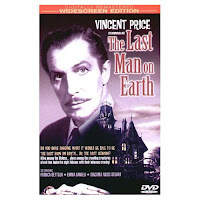 Dr Robert Morgan (Vincent Price) is the last man on Earth. Four years earlier a virus wiped out the entire population except for him. The major problem with the virus is that it causes people to come back from the dead as vampires. Every day Morgan goes out to find the vampires, drive a stake through their heart and burn their remains. At night he locks himself in his home and tries to survive the monsters outside. One day he is out and about and he finds two dead vampires that he was not responsible for. That is when he realizes that he is actually not alone. He finds a young woman and brings her into his home. Now he needs to find out if she is infected or not. The movie started off very well but short of fell short. The movie was moving along nicely and then all of a sudden it ends. I do not know if they ran out of money or what but it seemed to rush through. Price was very good though considering he was alone through most of the movie. There have been several versions of this movie made. Soy leyenda from Spain in 1967, The Omega Man in 1971, Night of the Comet (a favorite from my childhood) in 1984 and finally there is I Am Legend starring Will Smith to be released later this year.